After some snickerdoodles and orange spritz, I wanted something plain and simple. 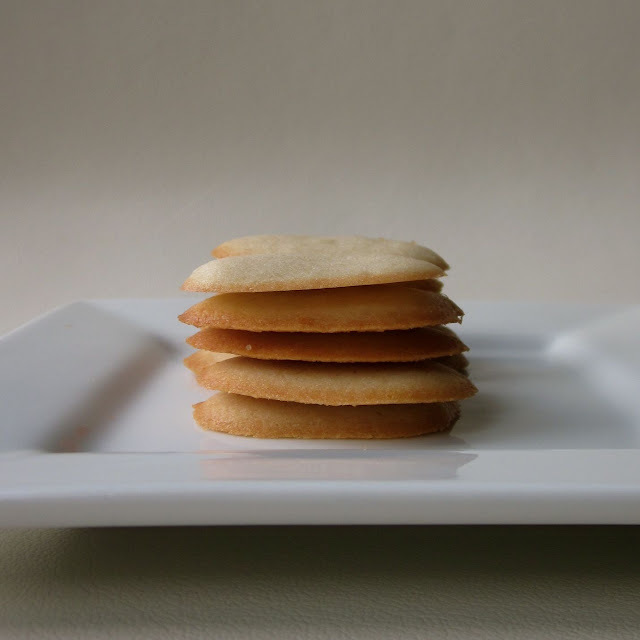 These buttery vanilla cookies are exactly what I was looking for. These are best right out of the oven, I think I ate a dozen of them. mix together the butter, sugar, salt, and vanilla extract until smooth in an electric mixer. gently fold in half of the flour. Then slowly mix in the egg whites followed by the rest of the flour. Continue mixing until thoroughly incorporated. put the cookie dough in a pastry bag fitted with a round pasty tip (about 1/4" inch opening). Pipe the dough onto cookie sheets in 1-1/2 inch lengths. Space the piped dough at least 1-1/2 inches apart to allow for spread. bake for 6 to 8 minutes, until the edges are lightly brown. ohhh it is like milanos. How long do you cook them? 8 mins? Less? Oh! oops, i left out the last step. you bake it for 6 to 8 minutes.